An account executive is the employee of the company who assures that the target of the company in terms of sales will be achieved. 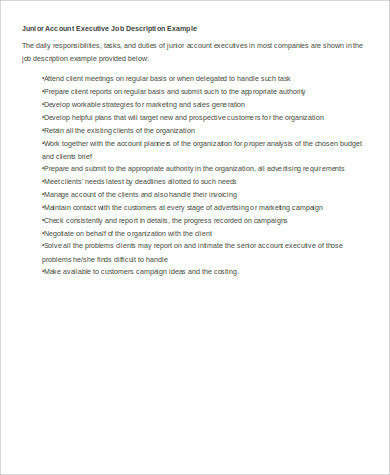 Each account executive is given a sales quota so that the group target of the sales department can be reached at a given period of time. There are many ways that an account executive can get prospective clients and there are also a lot of ways on how they can schedule sales transactions and translate it to actual business sales. 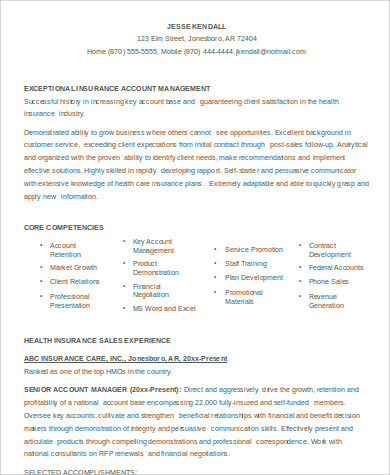 We can give you samples of an account executive resume if you want to apply for the specific position and you need guides on how to build your professional profile. 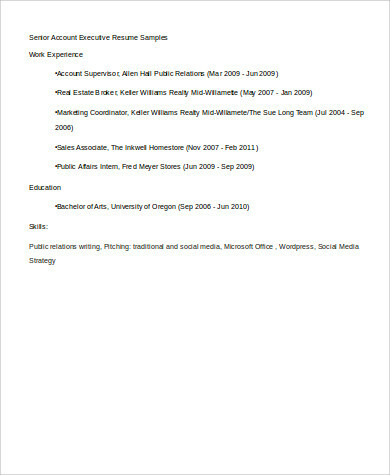 Moreover, we can also provide you with other Sample Resumes usable as references in creating different kinds of resumes for various fields of expertise. 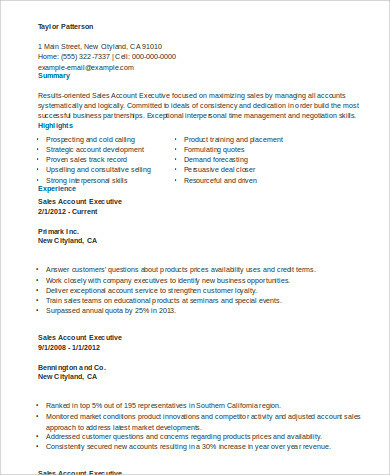 You will be tasked to do sales calls on a particular segment of the market. Be ready to talk to a lot of people and deliver sales pitches that can convince them to trust the company in terms of the products that they want to purchase or the services that they would like to acquire. You need to keep a record of prospective and existing clients so you can tap them whenever there are new offerings that the company would like to provide them with. You need to assure that all the transactions that will be done are of quality and that your clients will not have anything bad to say about the products and the services of the business so you can make sure that there will be customer retention because of the satisfaction that you have provided to your clients. You need to get as much clients as you can to assure that you will reach your individual target sales quota so you can be an effective part of the business. 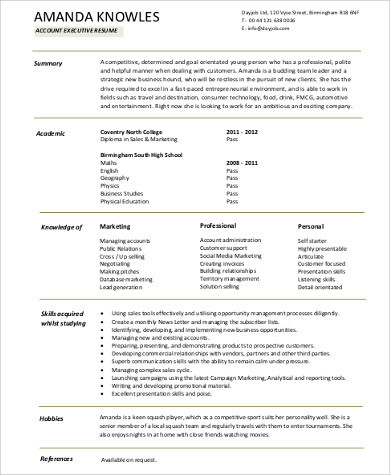 Other than our samples of account executive resume templates, you may also browse through our templates of different Sample Executive Resumes. 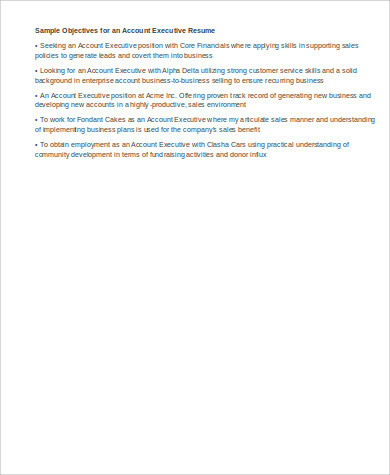 Write all your competencies in terms of the abilities and skills that are needed to be a successful sales person. 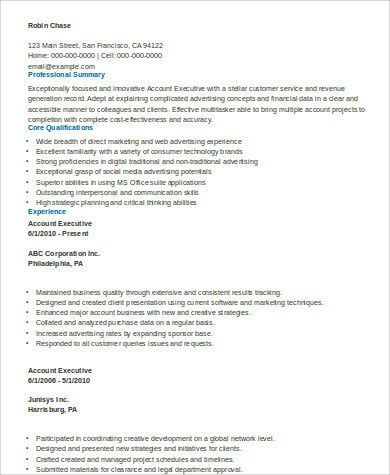 You may write the list of clients that you have already handled and the sales transactions that you are aware of doing. If you have a good sales track record, you may include the sales quota on a specific period of time that you have achieved to provide to the company that you previously worked for. Be sure to focus on the elaboration of the sales systems that you can work with, your ability to convince people to put their purchasing power in activities that can benefit the company, and your negotiation skills that can provide advantages both to the clients and the business. 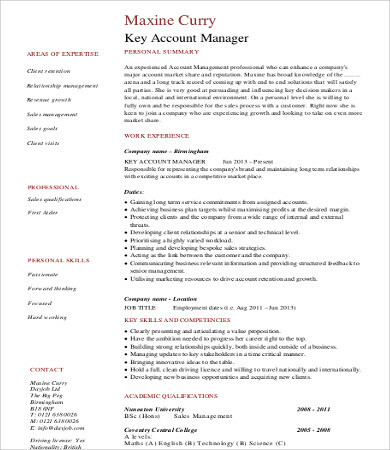 Other than our samples of sales executive resume templates, you may also be interested to browse through and download our templates of Sample Account Manager Resumes.